Hyper Fans are designed and built with many features that increase longevity, reduce operating costs, and drastically lower heat output. With a Next Generation "Multi Phase" motor that uses up to half the power of traditional EC or DC motors. The internal large sized, self lubricating ball bearings ensure smoother operation, less heat friction and increased lifespan, extremely quiet, long lasting and very reliable. Hyper Fans are designed and built with many features that increase longevity, reduce operating costs, and drastically lower heat output. With a Next Generation "Multi Phase" motor that uses up to half the power of traditional EC or DC motors. The internal large sized, self lubricating ball bearings ensure smoother operation, less heat friction and increased lifespan, extremely quiet, long lasting and very reliable. Hyper Fan combines Laminar Blade Design and Stator Technology inspired by the modern jet engine, to reduce noise, increase airflow and create the highest static pressure performance of any fan in it's class. 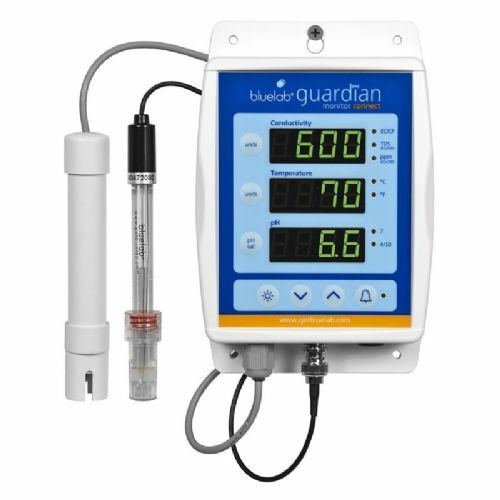 The included speed controller can adjust fan speed from 30% to 100%. It is detachable from the fan and independent from the power cord. 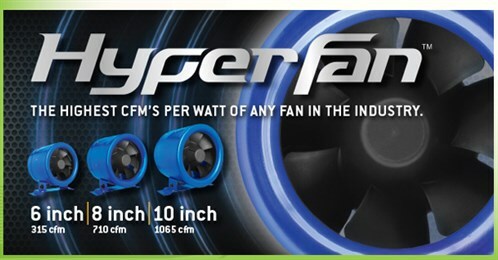 Hyper Fans are in a class of their own with innovative features, benefits, value and backed with a 5 year warranty... these vibration-free fans are truly one of best on the market. Uses about half the power as traditional fans. 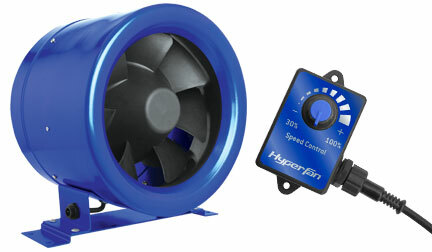 Lightweight aluminum housing is one-third the weight of comparable steel bodied fans. Universal mounting positions – can be mounted in any position allowing maximum flexibility during installation. © Copyright Lets Grow Hydro All rights reserved.